GARR has always supported the world of cultural heritage in the main research and study activities, protection and enhancement of cultural heritage. cultural institutions of international importance. And there are many excellences including the Colosseum and the Uffizi Gallery. The offices of these institutions communicate with the vast multidisciplinary community of universities and research and collaborate locally, nationally and internationally, through interconnection with other research and education networks. The main applications used on the network are the sharing and transmission of large amounts of data between institutions throughout the country that collect, store and process digitized goods such as books, paintings, archaeological finds and artifacts. The use of web applications also allows individual institutions to promote their activities more effectively on the protection and use of cultural heritage, with particular reference to information and training activities. The IDEM federated identity service is particularly relevant for the shared management of access to online resources, guaranteeing privacy and security and a deeply felt need by the library community, providing access to services for users of different types and with different affiliations. From videoconferencing to e-learning platforms, from libraries to high-performance computing portals, many resources are unifiedly accessible to members of the federation and its users. The collaboration between GARR and this vast community responds to the objective of using ICT technologies to serve the conservation, study and enhancement of the extraordinary cultural heritage of our Country. A concrete example is the SITAR territorial system (the georeferenced web "cadastre" that collects the archaeological information related to the metropolitan area of ​​Rome), entirely realized by the Special Superintendency for the Colosseum, the National Roman Museum and the Rome archaeological area in collaboration with GARR. Here, in addition to the organization of the dedicated network infrastructure and the fiber optic connection, GARR provided the IDEM federated identity service and the pre-configured IdP service. Still in the archaeological field, we recall the fiber optic linking of historical heritage assets such as the Colosseum, the Roman Forum and Palatine Hill and of the National Roman Museum (Crypta Balbi, Palazzo Altemps, Palazzo Massimo, Diocletian Baths) and, recently, the Superintendency of Pompei. Another example of the collaboration between GARR and the community dates back to the 80s: the National Library System (SBN), the Italian library network promoted by MiBACT with the cooperation of the regions and universities, and coordinated by the Central Institute for single catalog of Italian libraries and for bibliographic information (ICCU). The possibility of collaborating with a multidisciplinary community can create favorable synergies, such as adopting innovative and advantageous solutions for the deposit of digital resources. In addition, institutions connected to the research networks will be brought to publish data with the same standards, making digital resources interoperable and facilitating user navigation. 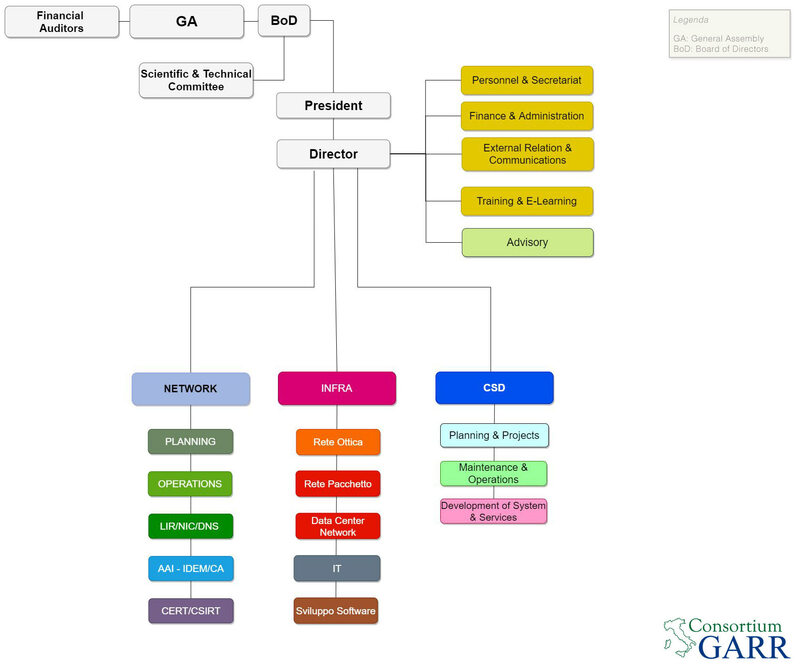 The primary objective of GARR is to provide industry specialists with a highly capable, reliable and flexible network infrastructure and services, thanks to which it can permanently guarantee multidisciplinary scientific collaboration at national and international level as in some ESFRI roadmap projects (DARIAH, CLARIN) and in other relevant initiatives such as ARIADNE, EUROPEANA. In these projects, GARR is particularly involved, as a technology partner, in DARIAH, a widespread infrastructure that aims to create a network of people, information, strategies, tools and methodologies to support researchers working for the digital use of heritage cultural. For this type of infrastructure, the connection to GARR is a resource for handling huge data streams in a reliable and secure way, archiving and storing data (but also making it easy to use by different types of users) and perform simulations that require high computing capacity. Moreover, membership in IDEM represents a guarantee in terms of security and privacy of users, nationally and internationally. Recently, GARR has signed the network agreement for the participation in the training project entitled "Scuola a rete" in Digital Cultural Heritage, Arts and Humanities (DiCultHER), aimed at creating a virtual school (widespread campus) for the acquisition of skills in the digital sector applied to cultural heritage, art and the human sciences. The project, coordinated by the Association of Italian Cultural Institutions (AICI), sees the adhesion of 60 Italian cultural organizations, including university departments, some CNR Institutes, the BAICR Consortium, ITS Foundations (Technical Institutes), Academies, Museums , Higher Institutes for the Artistic Industries (ISIA), the Italian node of the DARIAH research infrastructure and the General States of Innovation. One of the best known initiatives of this human network is the Week of Digital Cultures, which has a wide resonance at the national level. The collaboration with local public administrations and universities has also allowed the creation of extensive optical fiber networks, as in the case of the Metropolitan Networks in the city of Florence and Venice, which has enabled the connection of numerous institutions of world-wide value. These agreements bring benefits from the technological point of view, thanks to the services and high transmission capacity offered by these infrastructures at low cost. None of the actors involved, in fact, pursues profit-making.